The sandwich is universal. 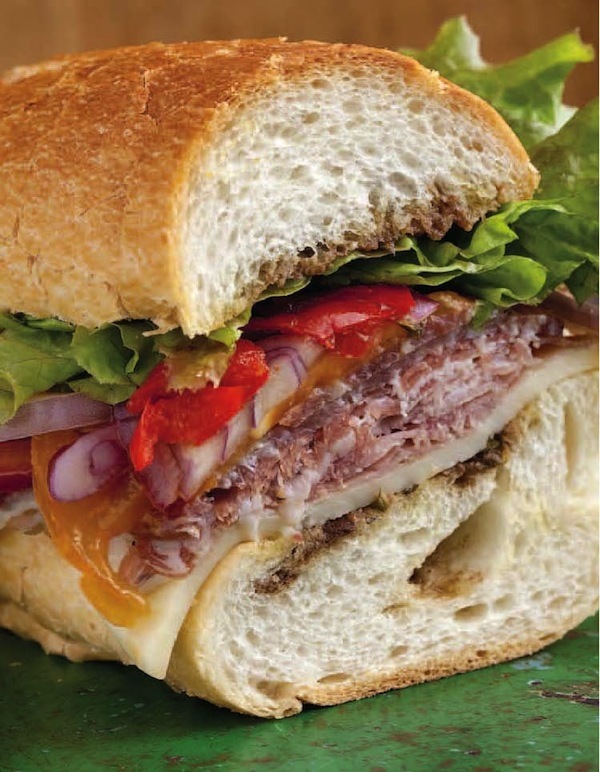 It may go by different names, but just about every culture and country has some form of “sandwich”. There is something comforting that comes with a well made sandwich. Maybe it’s the simplicity of something that you can eat with your hands. Or, maybe it’s a memories they can call to mind, a memory of something you could only get back home. I have many fond memories of eating grinders back home, but none that stick out in my mind more than the ones I’d find on Columbia Street in Fall River, Massachusetts. Though Columbia Street can’t be matched, I’ve tried my best to devise a recipe that comes close, and I think this one hits the mark. Cut the loaves of bread in half lengthwise, and arrange them in a single layer, cut sides up. Liberally brush the bread with the vinaigrette. On the bottom half of each loaf, evenly layer one-quarter of the provolone, followed by one-quarter of the mortadella, one-quarter of the spicy ham, and one-quarter of the salami. Top with 2 slices of tomatos and 3 slices of onion. Divide the cherry peppers among the sandwiches. Stir the vinaigrette and generously drizzle it over the onion and tomato. In a small bowl, toss the torn lettuce with some of the remaining vinaigrette. Divide the lettuce among the 4 sandwiches, top with the other halves of the bread, and serve. Just add mixed greens and you’re good to go! In a small mixing bowl, combine the balsamic vinegar, basil, oregano, and garlic; whisk well to mix. Continue whisking while slowly drizzling in the olive oil in a slow, steady stream. Add the salt and pepper, and whisk to combine. The vinaigrette may be stored in an airtight container in the refrigerator for up to 1 week. 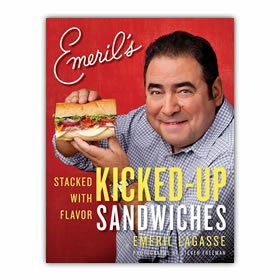 Thanks to everyone that participated in our first ever Twitter Cookbook Giveaway, and congratulations to @karenlaw6 for winning a free copy of Emeril’s Kicked-up Sandwiches: Stacked with Flavor. We’ll be giving away a new cookbook next month, so check back soon!